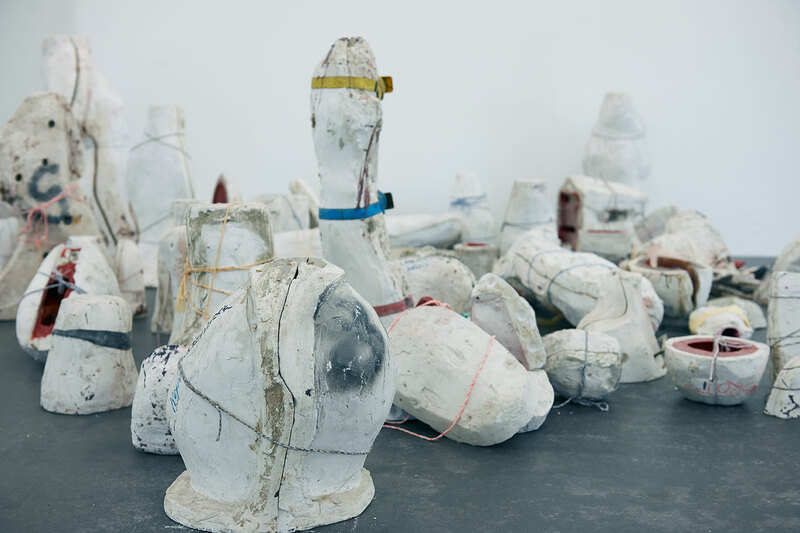 Plaster forms with silicon interiors that are used to cast iron sculptures and objects lie arranged in a heap in the space. Sebastian Utzni has borrowed this group of widely varying moulds, which once served in the production of works by other artists, from the Kunstgiesserei Hutter (foundry) in Amriswil for the duration of this exhibition. In the production process these forms offer liquid, flowing metal purchase, they give form to the formless. After use, the tools are put aside; they are no longer necessary. Their status shifts from being co-determining to being marginal elements. When the meaningful kernel becomes an autonomous object, the mould remains and retains the negative memory of the positive. Combined as a group with similar forms – transferred into a new being as a constitutive part of a work too – the comparison of these variations on a theme creates something meaningful.